College is becoming more and more expensive. Over the past thirty years, the cost has more than doubled. This is an average annual gain of about 2.8% a year in the long run. There are many different sources of data and the precise details of the costs and the increases vary by sources. 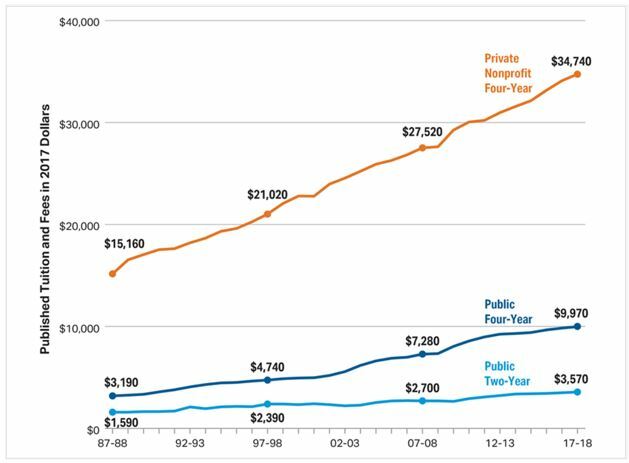 The data shown above is from The College Board, a not-for-profit organization that connects students to college success and opportunity. The College Board was created to expand access to higher education. Today, the membership association is made up of over 6,000 of the world’s leading educational institutions and is dedicated to promoting excellence and equity in education. The College Board also helps more than seven million students prepare for a successful transition to college through programs and services in college readiness and college success — including the SAT and the Advanced Placement Program. It’s data comes from its members and could be among the most accurate sources of data. While that data is reassuring, showing price increases roughly inline with inflation, other sources paint a different picture. And, it’s important to remember that it is historic data. 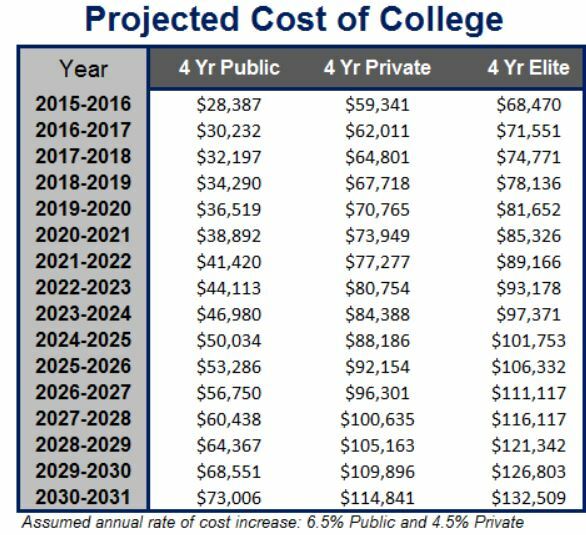 If you are thinking about college in the future, you need to consider future costs. Here, the picture is hardly calming. Children will be ready to enter college after high school and parents or grandparents will want to ensure they have the money needed then. A shortfall could mean a child doesn’t get attend the right school, or even any school. Given the high risks of a shortfall in funding, when deciding how much is needed, it is best to be aggressive in making assumptions about future costs. The table below shows the projected using cost increases that are higher than the average of the past. It will require a great deal of money to put a child through college ten years or more from now. But, families will make that sacrifice because education can bring rewards to the children throughout their lives. The desired student housing properties will be located within a one mile walking distance of major NCAA Division I universities that have over 15,000 students enrolled. The Division I schools are the largest schools which participate in intercollegiate athletics, programs that enhance the school’s reputation. This opportunity is available to individual investors with a minimum initial investment of as little as $5. 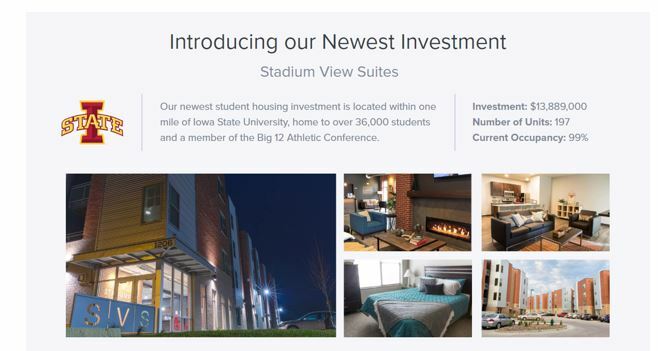 The latest opportunity meets those criteria with a student housing project a mile away from Iowa State University. The per unit cost of $70,502 seems to be reasonable for investment properties near a college. The shares represent an ownership stake and offer both the potential for income and capital appreciation. Since capital appreciation depends on an increase in price, your analysis should consider the per unit pricing of any investment. The strategy of investing in student housing is one many high net worth individuals have pursued for years. One way to do this is by buying a residence for a student when they attend the college as an investment property and selling when the student graduates. While that strategy is a desirable one, the investment requirement is significant. Rental properties have strict financing standards and generally require large down payments. RichUncles.com is opening that strategy to anyone with a willingness to invest at least $5. Your investment buys you shares of a company that owns revenue-producing student housing. The tenants in the buildings pay the investment company rent every month, and the income generated by those rent payments is distributed back to investors. There is no guarantee this investment, or any other investment in this category, won’t lose money. That’s especially true if the investor needs to sell quickly. This company does offer a liquidity provision that addresses that risk factor. Rich Uncles Student Housing REIT offers a share redemption program, which allows investors the opportunity to sell their shares back to the company once each month. While it’s restricted, the liquidity provision does exist. And, that is one of the factors that should be considered before making any type of investment.